The country’s leading independent and fastest-growing oil company, Phoenix Petroleum, partners with RCBC Bankard on a new credit card. 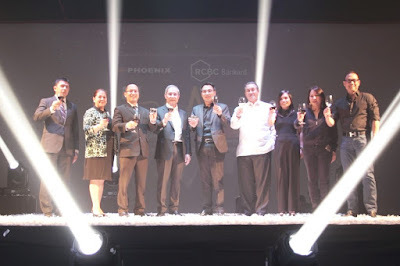 The Phoenix RCBC Bankard Mastercard, which bears the Phoenix PULSE Technology’s wave trademark in its design, is a lifestyle credit card with exclusive benefits for motorists, and lifestyle access and points for rewards. The Phoenix RCBC Bankard Mastercard perks and privileges start with a free P 500 Phoenix Fuel welcome gift. After that, cardholders will enjoy 5 percent fuel rebate on Phoenix fuel purchases, 5 percent discount on Phoenix gasoline and diesel engine oils, free towing and roadside assistance, accident insurance, and conversion of rewards points to free flights, gift vouchers, or cash rebates. “As Phoenix aspires to be an indispensable partner in the journey of everyone whose life we touch, we are proud and excited to introduce the Phoenix RCBC Bankard Mastercard, which has a full suite of exclusive and personalized privileges to fit the needs and lifestyle of young and hip Filipino motorists. The Phoenix-RCBC Bankard Mastercard is a continuation of our initiatives aimed at bringing our fuel products and services to a higher level and at providing a competitive and credible alternative from that of the majors,” Phoenix Petroleum Chief Operating Officer Henry Albert Fadullon said during the launch. Complementing these benefits are other privileges such as real-time SMS alert service that lets cardholders have security and control over their spending, conversion of straight purchases made anywhere to installment, access to cash anywhere in the world, free travel insurance and purchase protection, and a worry-free and rewarding bills payment facility. Starting April 27, 2018, cardholder motorists can start enjoying the new Phoenix RCBC Bankard Mastercard. Card applications can be made at participating Phoenix Petroleum stations, any RCBC branch, or online through the RCBC Bankard website.